cms really easy to configure and customize. structure solid and after sales very helpful and professional. This remarkable template would satisfy any of your customers due to its compactness and elegant look. The design focuses on pictures, which is important for highlighting results and achievements of your tattoo and piercing salon. Layouts for handheld devices are available to make viewing of the website more comfortable and handy. WPML is a function that makes it possible to make your internet site multilingual. WPML-ready WordPress layouts provide you with the ability to translate articles, meta tags, different categories, etc. in a selection of different languages. This may cause your internet subject material easier to understand for global purchasers. Bootstrap is a front-end network for creating websites and web-apps. Responsive designs alter to scaled-down along with bigger display dimensions automatically. Considering the growing popularity of mobile devices, the number of persons who log on to the sites from devices has increased significantly. This type of aspect permits you to adapt websites to mobile devices and diverse screen extensions, eventually providing smartphone owners with better alternatives. How can I modify WP template for Fashion & Beauty to suit my particular website? Please visit our Online Help Center to obtain detailed instructions on editing WP template for Fashion & Beauty. Can I use graphics from Beauty WP theme I purchased for use in printing? Yes, it's not prohibited to use the Beauty WP theme graphics for printed material, but the resolution of the templates graphics ( except for logo templates) is not enough for printing. Make sure that these charges for WP template for Tattoo Machine Manufacturer have different order IDs. If it is so, contact our billing department. I would like to purchase WordPress design theme for Beauty Tips, but it is not available on the site anymore. The WordPress design theme for Beauty Tips has been sold out for exclusive price or discontinued.As technology inevitably develops, TemplateMonster may discontinue the production of certain products. It can be no longer available for sale because of being outdated. Can I integrate the WordPress design for Tattoo Supplies with third-party software or applications for development of my new products? No, you cannot get the developers license for development of WordPress design for Tattoo Supplies or other products. Are images included in the WP templates for Tanning Salon released under GPLv3.0 license? In the WP templates for Tanning Salon released under GNU GPL v3.0 images are not included and are used for demo purposes only. Will TemplateMonster help me to install my WordPress design theme for Beauty Salon? Some of our products like osCommerce templates, Zen Cart templates, etc. require installation to operate. Installation services are not included in the package price. TemplateMonster though offers you a variety of sources to help you with installation of your WordPress design theme for Beauty Salon including installation instructions, some articles with our Online Help Center. Our Knowledgebase contains customers questions and most frequent problems. Anyway, you can always refer to our partners from TemplateTuning.com to install your WordPress design theme for Beauty Salon for you for a small fee. What is GNU GPL v3.0 license and can I use it with WordPress theme for Fashion Beauty? If you buy a WordPress theme for Fashion Beauty released under GNU General Public License v3.0, you can use it on any number of projects belonging to either you or your clients without any limitations. This license allows you to modify the template and its sources to suit your needs. What will I see instead of the images after installation of the Beauty WordPress design theme? After Beauty WordPress design theme installation you will see blurred images included for demo purposes only. Are there any restrictions for using imagery, cliparts and fonts from the WordPress theme for Fashion Beauty I purchased? All imagery, clipart and fonts used in WordPress theme for Fashion Beauty are royalty-free, if not stated otherwise on the product page, and are the integral part of our products. One Time Usage License and Developers License give you the right to use images, clipart and fonts only as a part of the website you build using your template. You can use imagery, clipart and fonts to develop one project only. Any kind of separate usage or distribution is strictly prohibited. What is the difference between unique and non-unique WordPress theme for Fashion Beauty purchase? Non-unique purchase:Non-exclusive purchase means that other people can buy the WordPress theme for Fashion Beauty you have chosen some time later.Unique purchase:Exclusive purchase guarantees that you are the last person to buy this template. After an exclusive purchase occurs the template is being permanently removed from the sales directory and will never be available to other customers again. Only you and people who bought the template before you will own it. Can I contact the WordPress theme for Beauty Store author? Yes. You can contact this WordPress theme for Beauty Store author/author's team directly using your personal account under the Support tab. Can I customize the WordPress design theme for Beauty Salon if that's required by application settings? Yes, you can customize the WordPress design theme for Beauty Salon code, graphics, fonts to any extent needed. Can I get the extended license for some other pricing than the half of the initial Fashion WP theme price? No. The price for purchasing license for a single Fashion WP theme is the half of the template unique price. Can I customize the Fashion & Beauty WP template? Yes, you can customize the Fashion & Beauty WP template to any extent needed. You cannot use a header of the template for one project though, and images from the template for the other project. 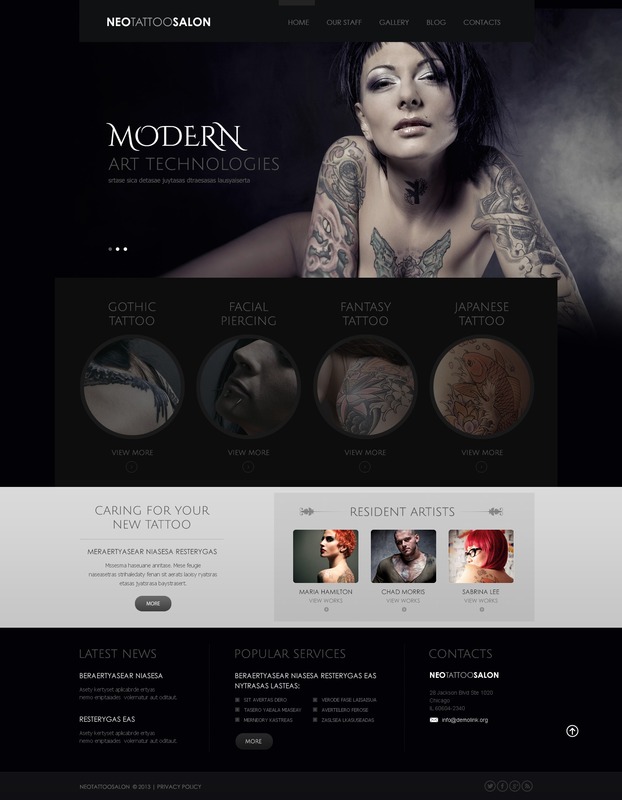 I like the image from the WordPress template for Tattoo Salon Equipment Shop and would like to use it for my advertising campaign, can you send me this image in a higher resolution? No, we can't provide image in higher size or resolution rather than it is on the WordPress template for Tattoo Salon Equipment Shop. We recommend looking for professional images on online photo resources. Can I resell WordPress themes for Fashion & Beauty Blog I bought the developers license for? You cannot resell the customized WordPress theme for Fashion Beauty as a template, but you may sell it as a project to your client. What is Extended License for Beauty Tips WordPress design theme? Is it possible to reactivate my download link for WordPress theme for Fashion & Beauty News if it was deactivated after 3 days? Yes. Please re-activate the download link for WordPress theme for Fashion & Beauty News within your account under the Downloads tab or contact our billing department directly regarding that. Do you provide any scripts with your WordPress designs for Salon or could you do some custom programming? Our templates do not include any additional scripts. Newsletter subscriptions, search fields, forums, image galleries (in HTML versions of Flash products) are inactive. Basic scripts can be easily added to a WordPress design for Tattoo Supplies at www.TemplateTuning.com If you are not sure that the element you're interested in is active please contact our Support Chat for clarification. In what cases I don't need the extended license for WordPress designs for Tattoo Salon Equipment Store? What are the advantages of purchasing a Fashion & Beauty News WP theme? The major advantage of purchasing a Fashion & Beauty News WP theme is price: You get a high quality design for just $20-$70. You don't have to hire a web designer or web design studio. Second advantage is time frame: It usually takes 5-15 days for a good designer to produce a web page of such quality. The theme is quite good and easy to adapt. Color-combination is good too. Buyout License $4,400 A Buyout License ensures that you are the last buyer/licensee of the template. You are granted a non-exclusive non-transferable permission to use the template on multiple domains.